Can Anyone Take Phil Heath's Olympia Crown in 2018? When one of the competitors has won seven Mr. Olympias in a row, you don't have to be a rocket scientist to pick the favorite for next year. But is Phil Heath a lock in 2018? Not necessarily. The crowd filed out the Orleans Arena in Las Vegas, site of the 2017 Olympia Weekend, as Phil Heath clutched another Sandow destined for his jam-packed trophy case. He's now tied with Arnold Schwarzenegger with seven Mr. Olympia wins. One more and he will blast into the Sandow stratosphere, joining eight-time winners Lee Haney and Ronnie Coleman. Yet, before Heath left the stage, the speculation had already begun: Can he do it again next year? When you have a physique like Heath's, you have the luxury of showing up at the Olympia" a little off" and still taking home the Sandow. But the quality of the other competitors at this year's Mr. Olympia contest left people wondering whether the reign of King Phillip might be nearing an end. Heath has eliminated his weak areas and transformed his physique into one insane 3-D package. Even so, the hounds are nipping at the champ's heels. The hype has been building over the last several years. "Any day now, Kai Greene is going to give Phil a run for his money," people say. Shawn Rhoden is pumped to go toe-to-toe with the champ. And one of the biggest freaks on the stage, Mamdouh Elssbiay, better known as Big Ramy, seems poised to bring his best package yet in 2018. It may be wishful thinking from those ready for new royalty, but even a year out, the stars are aligning for what could be an electrifying 2018 Mr. Olympia. "Introducing only the third ever eight-time Mr. Olympia…"
Those words could not sound any sweeter to Heath next year, but let's face it, his margin for error keeps dwindling. With so many amazing competitors out there taking the full year to focus relentlessly on winning the Olympia, there truly is a wide-open feel as preparation gets under way. Let's see who's got a shot at toppling Heath from his throne. The man who, in my opinion, has the best shot of knocking off the champ is Big Ramy. I liked the package he brought to the stage in 2016 when he was working with Chris Aceto. This year he took a break from Aceto and worked exclusively with Oxygen Gym owner Bader Boodai in Kuwait. This switch clearly paid dividends. Ramy was big, he was full, and he was just about where he needed to be conditioning-wise. He won the 2017 Arnold Classic Europe after his second-place finish at the Olympia. He's hungry. I can see him coming back better than ever in 2018. The biggest question is whether he can use the offseason to etch out more of that 3-D look Heath has, while still maintaining his size. He's certainly big enough to stand next to Heath, but he needs more detail. With the improvement we've seen Big Ramy make year over year, 2018 might just be the year he takes home the hardware in any show he enters. Next in line, I've got William Bonac. Each year I talk about how impressed I am with Bonac's physique, which reminds me of Greene's look. Bonac is a fierce competitor. He's got that look in his eye of a future Mr. Olympia champion, and he's got the size, structure, and conditioning to back it up. Placing third at the 2017 Mr. Olympia was clearly a step in the right direction for Bonac, who placed fifth in 2016. But even though he's climbing the ladder, he just might fall short of taking the title away from Phil next year, especially with Big Ramy standing in his way. That doesn't mean I'm counting Bonac out, but I think it's a stretch to think he can make enough progress in one offseason to pull it off. But he's definitely going to be in the running down the road. In the meantime, I'd like to see him compete in more shows during the year. There's prize money to be had out there, and I think he can walk onstage and collect just about any paycheck he wants. The 2008 Mr. Olympia winner, "The Blade" has simply fallen too far back to win a second Sandow. 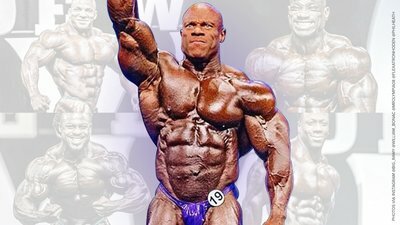 As the winningest competitor to ever step on a bodybuilding stage, Jackson's toughest foe at this point is Father Time. If you've compared his photos from year to year, you'll notice that his midsection has grown as he tries to put on more mass to compete with massive guys like Heath and Big Ramy. While it's not completely out of control, his slight stomach distention puts him outside of what I've always considered to be the ideal bodybuilder physique. Add to that the struggle he's having with his legs, and he's got his work cut out for him. As legends Kevin Levrone and Flex Wheeler can attest, aging legs can hold back anyone looking to make a comeback. Jackson is no spring chicken, and more than one person has wondered if he's a vampire, given his defiance of normal aging. He's going to give it all he's got this year, but I don't see him climbing to the top of the Olympia stage. Like Bonac, however, he can still collect some nice paydays if he gets out there and competes more. Coming off a second-place finish at the 2016 Mr. Olympia, Shawn seemed ready to bring a spectacular package to the stage and wow us all. After all, he was going easy on competing last year and had plenty of opportunities to improve his physique. For whatever reason, it didn't happen. In my opinion, Rhoden was lucky to make the top five at this year's Mr. Olympia. His conditioning was off, he didn't seem to have the size and definition he did the prior year. Rhoden needs to go back to the drawing board. Who, if anyone, do you think will land the knockout punch and drop Phil in the 2018 Mr. Olympia? Let us know in the comments!